Banking is ripe for disruption. As one of the main foundations of our economic systems, the banking system is a highly regulated environment. Every step a bank takes is always under close scrutiny since (fundamental) changes could have deep consequences on the overall economy. Nevertheless, banking is changing. And this change is increasing its speed, mostly due to information technologies such as the blockchain, which is already disrupting value chains and business models in the financial sector. In fact, right now Financial Technology, or Fintech, is one of the hottest fields for entrepreneurship, with start-ups and banks creating new products, services, and business models. Therefore, we are facing a potentially disruptive change in the financial world. Urs Gasser, from Harvard University, Oliver Gassmann, from the University of St. Gallen, Thorsten Hens, from the University of Zurich, Larry Leifer, from Stanford University, Thomas Puschmann, from the University of Zurich and Leon Zhao, from the City University of Hong Kong published a study called “Digital Banking 2025” to understand Fintech innovation. 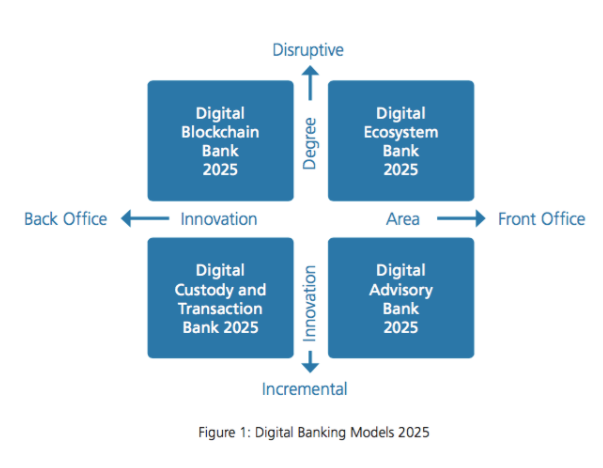 A framework to understand digital innovation in the banking sector. The result is a highly valuable research paper for any Fintech entrepreneur, innovator, finance professional or banker. The study shows the key elements of understanding and navigating the financial revolution we will see in the coming years. It will help stakeholders in the financial services ecosystem to make better professional choices. The Digital Banking 2025 study is available as a free download on our webpage. Just click on the image below and enjoy your read! DOWNLOAD THE DIGITAL BANKING 2025 STUDY. Older PostFrom product to business model innovation: TICK, the laundry on demand service from Migros.